When researching different webinar platforms the first thing you will most likely notice is the vast amount of webinar providers available. Every webinar provider essentially varies by the features they have to offer and the price per license. One reoccurring theme among webinar providers is that their platform requires participants to download and install their system. This can be a major inconvenience for those who wish to hold quick impromptu meetings, and severely limits the ability to reach a broader audience. Onstream Webinars makes it incredibly simple to set up feature rich presentations that are easily accessible to your audience. Simply create your meeting in the account center and send the room link out to your participants. It’s that easy! No downloads required. 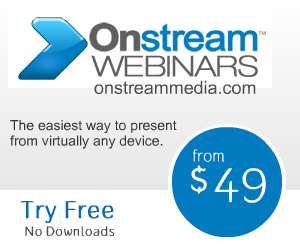 To learn more about Onstream Webinars and to try out a Free 30 day trial, please visit www.onstreamwebinars.com.